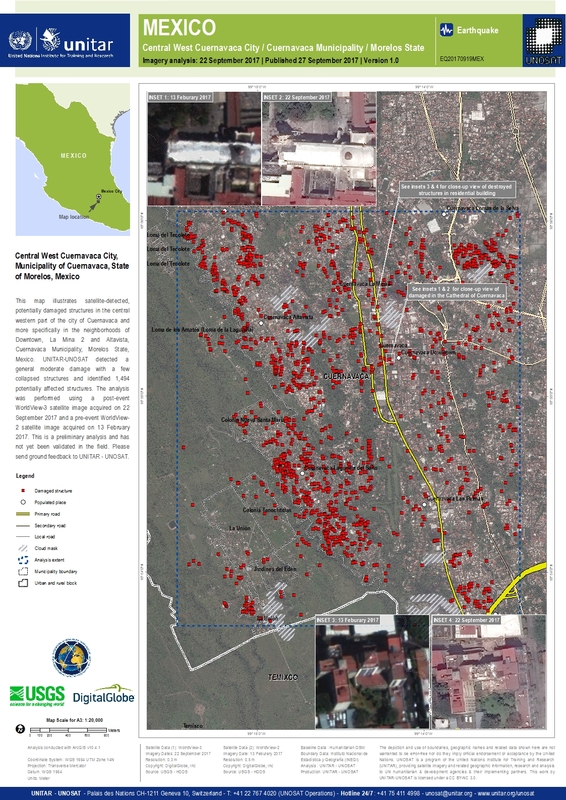 This map illustrates satellite-detected, potentially damaged structures in the central western part of the city of Cuernavaca and more specifically in the neighborhoods of Downtown, La Mina 2 and Altavista, Cuernavaca Municipality, Morelos State, Mexico. UNITAR-UNOSAT detected a general moderate damage with a few collapsed structures and identified 1,494 potentially affected structures. The analysis was performed using a post-event WorldView-3 satellite image acquired on 22 September 2017 and a pre-event WorldView-2 satellite image acquired on 13 February 2017. This is a preliminary analysis and has not yet been validated in the field. Please send ground feedback to UNITAR - UNOSAT.